A great way to enjoy the best of the countryside, whether you already have experience of just starting out. 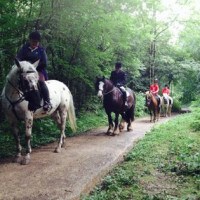 Perfect for groups of any size, horse riding is available through out the UK. Horse riding and pony trekking is a great way to enjoy the best of the countryside, whether you already have experience of just starting out. For beginners, learn this new skill in the careful hands of our expert horse riding teachers. Or if you are already experienced at horse riding there are hundreds of more advanced tracks and trails for you to explore. Perfect for groups of any size, horse riding is an activity that is available through out the UK and is great for birthday parties, school outings, or for any special celebration or event. Let us find a horse riding centre near a location to suit you and let you know about other activities and accommodation options that might be of interest.